With tomorrow's primaries in the big states of Florida, North Carolina, Illinois, Ohio and Missouri, the realization that Ted Cruz will fall further behind Donald Trump is setting in with Cruz's supporters - specifically the few Bitter Cruzingers among them who are the focus of this post. It may end differently - the risk I'm taking with this post - but there are signs beyond the polling data that suggest I am right here. Ben Shapiro appears to be the first Bitter Cruzinger to realize he went too far. He resigned yesterday from Breitbart. Describing Stephen K. Bannon’s chairmanship of Breitbart News as betraying the mission of the site’s founder, Andrew Breitbart, Shapiro described the editorial direction of the site as having taken on the role of being a propaganda outlet for Trump. A bit arrogant to assume one's ideas and positions are in sync with the genius, Andrew Breitbart, no? A Cruz supporter, Ben had recently used his position at Breitbart to promote Cruz insult Trump and his supporters. He even jumped on the Michelle Fields grabgate crusade. Not because the charges were serious. They weren't. Not because it was true. It wasn't. But because he saw an opportunity to weaken Trump's momentum. He failed. Like all Bitter Cruzingers, Ben has pissed away his credibility out of loyalty for a candidate that couldn't attract over 20% in national polls despite having Ben's, Rush's, Levin's, and Beck's full and unconditional support. Ben is a smart guy. While I'll continue to ignore his 'analysis' through the rest of the 2016 election cycle, I hope he learns from his mistakes and sticks with conservative activism beyond November. Unity, just in time for Tuesday's primary results . . .
. . . and the coming celebrations. The tweet above is incredible. Do you see it? They live to "tell" me something about my candidate. Why? Because they have nothing to say about their own guy. Some background: The Bitter Cruzingers attacked on January 15th - the day after a debate where Trump questioned Cruz's eligibility. Cruz deflected that charge like a champ, by the way. I thought it was a non-issue at that point. But the attack on Cruz brought out the Bitter Cruzinger blitzkrieg that continues today. From that point on, Cruz and his supporters attacked. Not one new policy position was presented by the candidate, nor were any previous positions promoted and discussed. Same for his supporters. The reams of FB threads and Twitter tweets and blog posts were all the same: attacks. Attacks ranged from calling Trump supporters "stupid," to "brown shirts" to "low information" to implying fascist interests, to innocent questions like, "Why would you support someone so vulgar?" or "Do you really think he'll build that wall?" If only Cruz and his supporters could have these 8 weeks back. They shoulda kept the focus on policy. They coulda spent that time talking about his platform and the incredible spin-off benefits of a smaller government, of an IRS-free US, and of solid Supreme Court nominees. I would have been an active participant in those discussions, and Cruz woulda been a realistic option for me in tomorrow's primary here in Ohio. "Conservatives of the World, Unite!" Yes, that volunteer badge is mine, and I want to thank John Hawkins, Ben Shapiro and the other Bitter Cruzingers. They are the ones that took my modest interest in Trump as one of the many good GOP candidates in 2016 and converted it to absolute loyalty. It wasn't Trump that led me here, I was pushed. And I've met other volunteers who joined for the exact. same. reason. I have never volunteered for a campaign before. Never considered it. But thanks to the Cruzingers, I have decided to do whatever I can do to help Trump win. I haven't done much. I spent a few hours this past week walking nearby neighborhoods, handing out signs and saying "Hi" for Trump. I also helped out at yesterday's rally. Depressingly, about 80% of the Ohio Republicans I spoke with were Kasich voters. I remained professional as I was representing Mr. Trump, but I wanted to ask, "Why aren't there any Kasich guys walking your neighborhood, and why aren't there any "Kasich" signs?" The answer, I suspect, is John Kasich supporters lack passion and avoid going out in public where they may be asked specifics about his platform or their reasons for supporting him. I also met closet Trump voters. Those who have cowered under the Cruzinger insult peer-pressure onslaught from 'friends' and other trusted connections since January. They did not take a sign for this reason. Sad, but I understand. On the flip side, I am so proud of those who took signs. 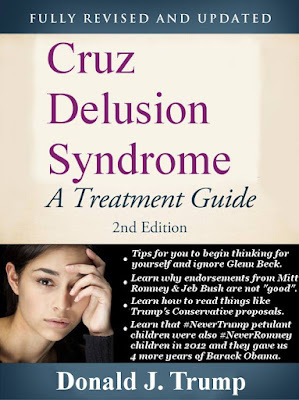 They too have suffered Cruzinger attacks, and the sign was their opportunity to fire back. It was nothing short of awesome to hand a sign to these homeowners, who dropped everything they were doing, who marched out to the most visible spot in their front yard and placed their sign like they were at the top of Suribachi. Unlike the Bitter Cruzingers who have spent their valuable credibility in these past weeks, I will have nothing to regret from my behavior during the 2016 election season. FB Comrade CST shared this today. Finally the Bitter Cruzingers can get some help! I've inspired others to create their own lists! Behold Truthfeed: 10 People Who Have Ruined Their Reputation By Betting on Trump Losing. ...Donald Trump has left all America’s adversaries naked to their enemy, and for the first time in decades we were afforded an awakening to see who the enemy is “inside the wire”. David Horowitz writes his own Bitter Cruzinger piece at Breitbart: Trump Derangement Syndrome.